This one pot meal is a great and healthy way to simplify dinner. 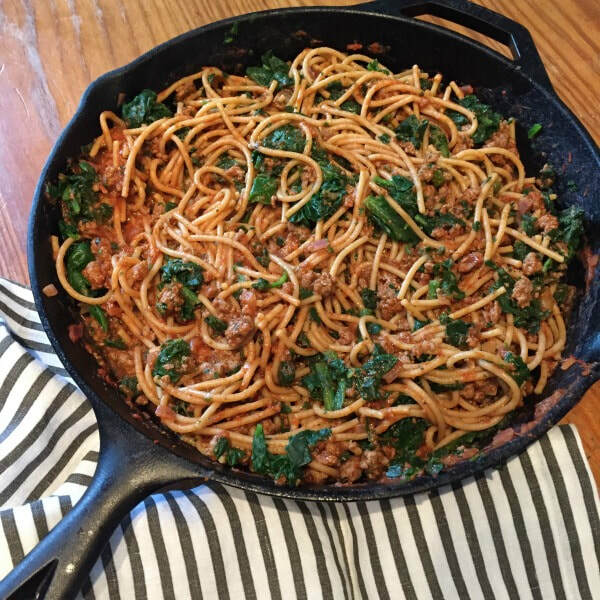 These Skillet Noodles with Beef and Spinach are a family favorite that kids are sure to love. Brown ground beef in a large skillet. Drain and rinse to remove excess fat. Add onion, tomato sauce, water, and spices to the drained, cooked beef. Cover and bring to a boil. Add noodles. Cover and simmer for 5 minutes. Defrost spinach in the microwave. Drain and squeeze out excess liquid and repeat if necessary. Stir spinach into skillet mixture. Cover and simmer for 5 minutes. Stir mixture and sprinkle with shredded mozzarella. Cover and simmer for 10 minutes. Add water if mixture gets too dry. *Nutrition information includes whole wheat spaghetti in analysis.